Did You Know… your physical body consists of 70% water and is an amazing electromagnetic conductor! It is continuously impacted by the negative or positive words you speak into it. Your head acts like a loud speaker. Every word spoken through your mind (and mouth) is echoing a vibration throughout every cell in your system. On the road to healing oneself, the first thing is to understand is what being human actually means. Our physical bodies are a reflection of the thoughts we think. The decisions we make each day shape our physical form, and this is what we feel inside and see in the mirror. Who we believe we are in the world is a product of our thoughts and imagination. All our thoughts, beliefs and intentions unfold the reality we see around us everyday. If we that believe that something is real or true, then it is so. Physical disease manifests in the body as a way of waking ourselves up. We are here to enjoy this life. If we are caught in a pattern of not enjoying life, and not feeling at ease with ourselves or anyone around us, we must take action or retreat! Disease is the one thing that stops everyone from living an unhealthy life. It is also one of the greatest spiritually awakening agent we know of. Thoughts are things. The thoughts you think are physically received by your body as you are thinking them. Living in an unhappy, unsatisfied and uneasy energy for long periods of time, we start walking around projecting this energy into everyone and everything in our outer world. We may start criticizing, judging and blaming others (and ourselves) for this energy we feel inside and thus weaken our life energy even further. With negative energy building up inside, we tend to overextend ourselves mentally, emotionally or physically. Eating a poor diet, little exercise, little sunlight, and can for long periods of time. As we are not listening to the body’s need for rest and stillness and eventually empty out our life energy reserves. We become depleted of healing energy, and a state of disharmony with our environment and dis-ease inside our body begins to manifest. Signs that we are reaching closer to a disease manifestation is that everyday we constantly feel uptight, anxious, weak, agitated, easily aggravated, and all of these are signs that we are susceptible to manifesting an actual physical disease. If we go though life being angry and negative towards others (or ourselves) we generate a field of negative energy in our aura. It impacts all molecules in that field of energy and can extend up to 8 meters away. If you’re a sensitive person, you can feel someone in a room who is not a happy person. Their energy feels like a hard heavy weight that pulls everyone down in their path. The impact of another’s energy can affect us over time. If we are around a negative person daily, eventually these negative thought patterns create negative energy fields in ourselves, and disrupt our own body’s healthy physical functioning. If we do not take a proactive healing approach to the situation, confronting the person with their negative thought patterns, we may eventually get pulled into their negativity with them. If we then own that negative state as our own, disease starts to manifest. 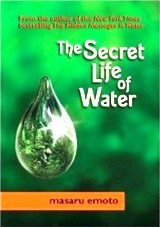 If you read the book, Hidden Messages in Water, you’ll find out about Mr Emoto’s world famous experiment with thought projections onto water and how he scientifically proved that thoughts actually change the physical molecule structure of the cell. These microscopic photographs (below) are of actual water molecules at near freezing temperatures that have been exposed to hateful and loving thoughts and feelings. You can see that thoughts have a powerful, clear and crystal-like effect on water molecules when are exposed to loving words. Whereas, water exposed to unloving words has imperfect and harsher looking unclear patterns. 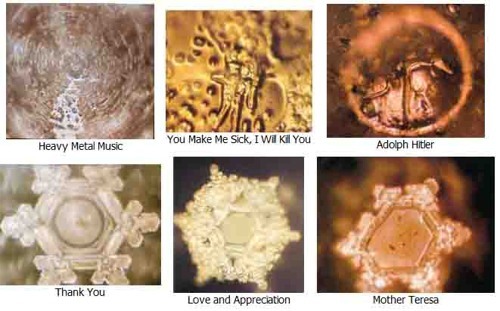 It’s easy to see here what the vibration of love truly looks like INSIDE our body! It has been scientifically proven to create a shape that is symmetrical, beautiful and a structure that feels good to look at! The perfect state of physical healing is the physical manifestation of billions of these molecules throughout our body. All the molecules in our body are directly effected by the words, sounds and thoughts they are exposed to. To begin healing you body you first need to make the decision to only speak positive powerful words for your body to hear. 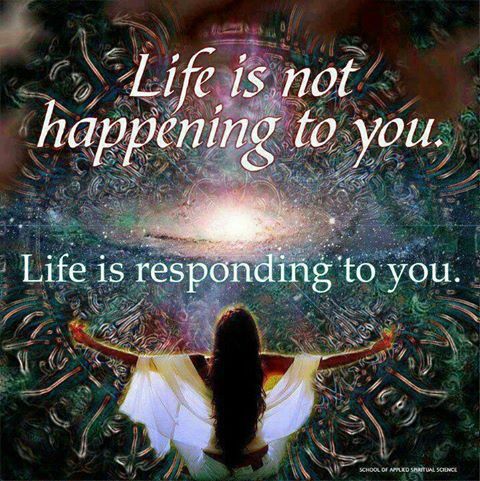 This alone will create amazing shifts in your physical body on a molecular level. 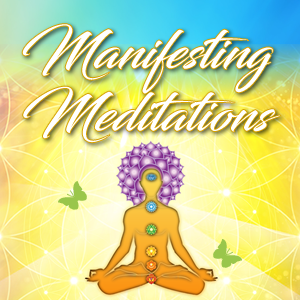 This practice will send loving thoughts and feeling into every cell throughout your entire body, you will feel much more healing, love, joy and connection with others than ever before! The more loving energy you send towards yourself, the healthier you will be and the more energy you will have. Self-love will literally create a physical healing reaction throughout the body. As you send more and more positive loving thoughts to yourself, you will hit a “breaking point” where the dis-eased physical cells throughout your body will have mirror the internal dialog. They will follow the majority of the tribe, shifting their DNA pattern back to one of being healed and normal. This healing process can take anywhere from 3 -6 weeks depending on how much resistance you have to FEELING the positive thoughts resonating inside your body. Do not let time limits constrain you. Anything is possible. There is scientific documentation of tumors being healed in under 3 minutes with the projection of positive thoughts. Please visit my healing center for more information on how to heal your body and life! 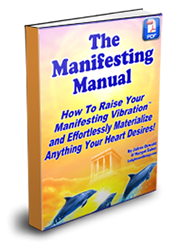 I also have a high vibration online Super Manifestation Program that is guaranteed to increase your vibration and help you manifest anything you want. Try it out for 90 days and you’ll shift your entire life in the most amazing ways! Enjoy!